Cleveland Golf first introduced the TA (Tour Action) moniker in their wedges, which had a nearly cult following on the PGA and other pro tours. 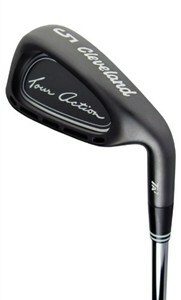 The TA7 irons were rolled out in 2002 -- yet another in a series of TA inspired iron sets. What sets the TA7 apart from many of the others is the "Microcavity" design that removes weight from the top-line of the club and disperses it around the perimeter of the clubhead for tighter shot dispersion, even on off-center hits. The TA7 is a direct takeoff of the still popular TA5 model. The TA7 is available in the dark gunmetal finish that many people prefer to chrome. It does have a non-glare surface; the contrast between the dark club head and white ball is bound to create confidence when setting up to the shot. Add to that the progressive offset throughout the set and you have a club that is easy to swing, forgiving on off-center hits, and easily gets the ball airborne, even from tough lies. I have been a user of Cleveland irons for many years now (the TA2 model) so can attest first hand to the performance, quality, fine finish, and attention to detail found in every Cleveland club. This TA7 set is comprised of the 4-iron through PW + GW (Gap). Shafts are the Cleveland Action Lite in steel (Uniflex). Uniflex shafts utilize a variable flex throughout (designed for swing speeds between 75 and 95 mph) the set that takes advantage of the length (and thus speed) difference of each club in the set. For some comparison shopping, check out other similar irons like the Cleveland TA5 or Nike Ignite 2 sets.